If there are any confirmed football fans left still standing, Multi-Player Soccer Manager might be just the thing to ease them gingerly into the new season. As its name suggests, you and up to three like-minded friends (if you can find three like-minded friends) can each control a national team. The game is run from a icon menu, with all the available options clearly displayed. Each player takes it in turn to deal with the running of his team. There are a multitude of decisions to make, ranging from extracting finances from the bank to altering the size and safety of your stadium. Your squad members have skill ratings which rise and fall. You must give them adequate training in the skills you think they should acquire. You could teach your goalie to head the ball, for example, or give your defenders long-range shooting skills. There is also a transfer market in which you can purchase any ace players available, or flog off your burnt-out has-beens to raise a few quid. As well as the team, you can pay through the nose for a better Coach, Scout or Physio. All will improve your chances in both the league and the cup. The only limit is your dosh. Buying one decent player will seriously reduce your wad, so tight-fistedness might be wise to start off with. There really are a whole host of options available to the diligent player. 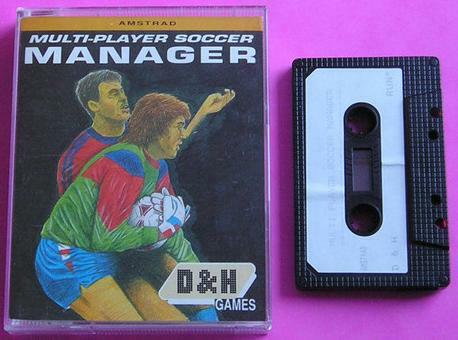 When playing with human managers as well as computer ones it can take quite a while for each player to make all the changes he feels are necessary. Once everybody is happy, you can play the next game. Unfortunately, there is no running commentary, or half-time status reports, so there isn't time for excitement to build during the game. The results of the four divisions are displayed page by page until you see how your lowly team has done. 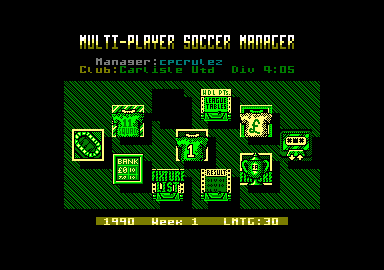 The game has 64 teams, up to four of which can be run by human players. Any of the team names can be changed, as can any of the players names. It is possible that you can get carried away with this option, and start renaming everything and everybody. 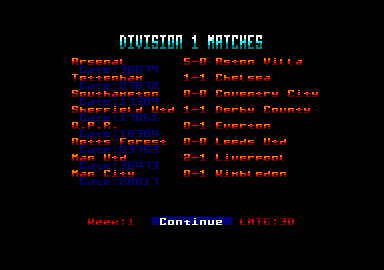 This results in positively surreal league tables and team lineups; Amstrad Action was beaten by the Ninja Turtles, with a last minute goal by Donatello. Playing the game is made easy by the use of the joystick and the minimum of fiddly text inputting, but actually progressing up the league is tough. It is difficult to whip your team into shape without spending hours and hours trying, and you come to dread the results table. Yes, there you are, still at the bottom of Division Four. Luckily you can save and load from the main menu, so you can return time and time again to find that, yes, you are still at the bottom of Division Four. The Cup is periodically vied for and, with huge cash incentives at stake, your pitiful players seem to do better than in standard league games. Despite the slowness of the game when more than one player is involved, it is more fun. It tends to degenerate into a battle between the human players, which can be very entertaining. Crowd violence also erupts occasionally, and fines are slapped on the clubs involved. The level of detail is high, with a great many variables to consider. There are a lot of potential surprises to spice up the proceedings too, such as retirements, sackings, grants and even resignations (you always have this option, remember). Graphics are OK. A rather trendy space-age font is used throughout, and there are many colours for various parts of the text. Nevertheless, it isn't awe-inspiring. You will need enthusiasm in fairly large doses to keep going, but if you have other people to play along with, it might make all the difference. The sound is limited to beeps when you have clicked on items or made your selections. Nothing else would really be appropriate and might even be obtrusive. Overall, Multi-Player Soccer Manager is a competent and thorough attempt at a classic old idea, one which alas really is getting a bit tired these days. It all works well, and is quite challenging and difficult to play successfully, making promotion a possibility rather than a certainty. You must address all the factors if you want your team to beat their rivals. 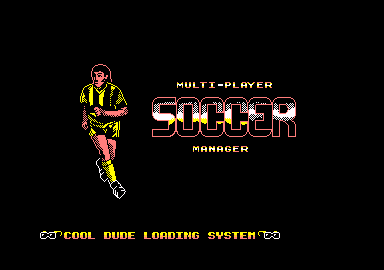 The soccer atmosphere is really left up to the player(s), because all that appears on the screen is text and the ocasional icon. Having said that, if managing a rather drab Fourth Division club up to Division One, with a stab at the FA Cup thrown in appeals to you, this could be just the ticket.